A slower, more realistic, but also more dull version of legends of the fall. 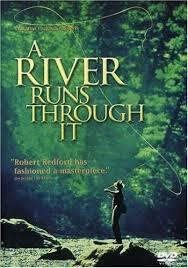 River Runs Through It will always be known as the movie that kick started Brad Pitt’s career. Sure, there was Thelma and Louise before it, which was a much bigger hit, but Pitt had little more than a cameo in that movie. His role was just slightly bigger than his appearance as Floyd in true romance the year after this film. As far as starring roles went, it was a river runs through it, then interview with the vampire, then legends of the fall. By the time interview was released, Pitt was already a household name. Another reason why a river isn’t known for much else, besides Pitt’s breakthrough, unlike Thelma and Louise, is because it’s not all that great. Certainly it’s nothing special. Thelma and Louise were unique and creative and went on to become an American classic. So did legends of the fall. A river runs through it, on the other hand, kind of got sandwiched in between as a want to be film. It certainly went for the wholesome American classic vibe, with a boys growing up in Montana idea, but it just didn’t deliver the same way those other movies did. That’s because a river runs through it is based on a true story of a man’s memoirs as he looks back on his life, and because the movie doesn’t even try to divert away from any of that. It doesn’t try to embellish or to tailor a film more for an audience than for the writer himself to keep everything exactly as it must have happened. In legends of the fall, we got wars, killing, government corruption, bootlegging, the whole nine yards. We got action and violence and Ed Zwick showed us that his directorial effort on glory was more than just a stroke of luck. But a river runs through it wants none of that. Instead, we get a lot of potential where everything is set in place for something big to happen, only nothing ever does. We get Brad Pitt’s character, Paul, bringing out a Native American girl to a bar that doesn’t allow her kind. He has to talk the bouncer into letting her through the door, and then she has to get the waitresses attention just to have her drink order taken, but other than that, and the occasional dirty look every once in a while, nothing much happens. She and Paul dance up a storm in front of everyone. That’s it. There’s no fight, like one would expect. I mean, here this guy is breaking the rules of the place, bringing a girl who is not welcome into a bar where people are wildly against it, and those people have been drinking, and still, nothing. It’s kind of ridiculous. There are more examples like this, all of them involving Paul, the wild card of the film. His brother, Norman (Craig Sheffer) is the star of the film, only you’d hardly know it because of how boring his life is. 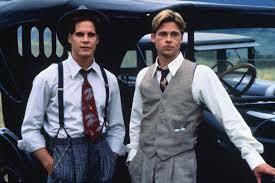 Brad Pitt played the wild card character in Legends Of The Fall as well, and had a hell of a lot more to work with there. Here, in a river runs through it, his mischievous actions are spoken about but rarely if ever are they shown. We get a couple of scenes of Norman driving to the police station in the morning to pick Paul up from a cell. Paul is constantly getting into fights and being locked up until someone comes to get him, only we don’t get to see any of these fights, just hear about them. In one instance, the guard tells Norman about how a guy made remarks about the Native American girl and that’s what provoked Paul’s fighting. Why don’t we get to see this scene? Even a scene that we are lucky to be a part of, where fighting does happen, makes it so that the action is pretty much all hidden from us behind a half-closed door. Paul goes into a back room while Norman stays outside and watches, and we can barely see a little bit of feud breaking out inside. I get that they movie wanted to keep things from Norman’s point of view, and so we are right there outside the room with him, seeing exactly what he can see as the fight takes place away from him, but for a movie, that is no fun at all. Even when something drastic does happen to one of the main characters, we don’t get to see any of it. We hear about it, and watch the characters deal with the consequences, but that’s all. It’s as if this movie is toying with us the whole way, refusing to give in and show us the scenes that could actually make it an interesting and exciting film. The movie is about the brothers growing up, and every once in a while we get an enjoyable scene like their white water rafting or their taking a young man out fishing and watching him get drunk and sunburned. But these scenes are not very frequent, and most of the movie is set in the quiet house or by the lake as the characters stand around fly-fishing. It might seem obvious that a movie about two brothers who go fly fishing would be kind of dull, but somehow I expected more from this movie. Especially when considering how great legends of the fall was. Robert Redford, who also supplies the voice-over narration, directed the movie and I guess he was too big a star for someone like pit to turn down. But Brad Pitt sure did get better at choosing his roles. He started out pretty lousy at it with movies like this and Cool World, but once Legends hit, there was no turning back. After that, there was interview with the vampire, then seven, and then twelve monkeys. And as far as a river runs through it goes; it could have been a much better film. I would have liked to see the movie that got made from this same story, only told with a bit of a more cinematic edge. Instead of hiding the fight scenes, I’d have liked to see them. If there’s a character that keeps getting thrown in prison, then show us why; don’t just tell us about it. This could have certainly been a better film.